Boston University student organizations hosted an African Diaspora Cultural Dinner at Warren Towers Dining Hall Tuesday evening, featuring traditional cultural dishes as well as informational displays about African culture arranged throughout the dining hall. Members of BU’s Student Government, the BU African Students Organization, UMOJA: the Black Student Union, and the BU Students of Caribbean Ancestry helped host the Cultural Dinner. SG President Devin Harvin, who was in attendance, said that preparations for the cultural night began in October. Event organizers met every other week for menu planning and taste-testing of proposed dishes, he said. The finalized menu included curried chick peas, fried plantains and collard greens, as well as mandazi, a coconut doughnut, and zobo, a hibiscus beverage. Historical descriptions of the cuisine were also displayed adjacent to several serving stations throughout the dining hall. Phillip said she also championed the collaboration of student organizations in the planning and implementation of ideas for the event. SG Executive Vice President Hafzat Akanni, along with African Student Organization co-presidents Vivian Okoye and Eunice Aworanti, said improvements for future cultural nights could include varied menus and larger hosting spaces. When questioned about planning similar events for other campus dining halls in the future, the organizers collectively stated their approval. Menen Crawlle and Kahjirah Taylor-Harris, both freshmen in the College of General Studies, said they thought the menu descriptions were enlightening and that they appreciated the event’s inclusivity. Taylor-Harris said she believes the event allowed students and the larger BU community to simultaneously witness and engage in African culture. 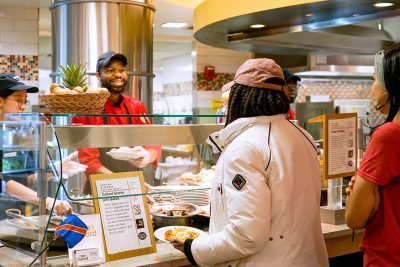 College of Arts and Sciences freshman Erika Pettway, also in attendance Tuesday, said she was fascinated by the African flags adorning the walkway into the dining hall, and that the infographics near each serving station “piqued her interest” about African culture.